Broccoli, the Queen of Brassicas! In SoCal’s ‘winter,’ Brassicas reign! Broccoli may be the most nutritious of all the cole crops, which are among the most nutritious of all vegetables. Broccoli and cauliflower (and other members of the genus Brassica) contain very high levels of antioxidant and anticancer compounds. These nutrients typically are more concentrated in flower buds than in leaves, and that makes broccoli and cauliflower better sources of vitamins and nutrients than cole crops in which only the leaves are eaten. The anti-cancer properties of these vegetables are so well established that the American Cancer Society recommends that Americans increase their intake of broccoli and other cole crops. Recent studies have shown that broccoli sprouts may be even higher in important antioxidants than the mature broccoli heads. Other research has suggested that the compounds in broccoli and other Brassicas can protect the eyes against macular degeneration, the leading cause of blindness in older people. If you choose to eat broccoli leaves, you will find that there is significantly more vitamin A (16,000 IU per 100 grams) versus flower clusters – the heads (3,000 IU per 100 grams) or the stalks (400 IU per 100 grams). Broccoli vs Kale? Do both! 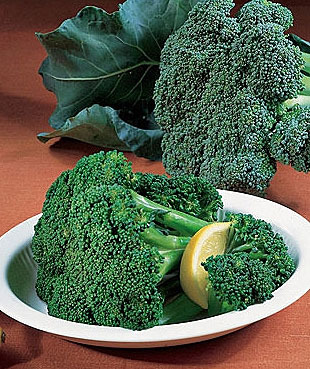 Broccoli This green veggie made the list of top 10 superfoods, which comes as no surprise. One cup florets contain 20 calories, 2 grams protein, and is an excellent source of antioxidant vitamins A and C. You’ll also find a touch of almost every other vitamin and mineral in it. Moreover, broccoli is brimming with plant compounds like indoles and isothiocynates, shown to help fight cancer. In addition to its nutritional goodness, broccoli won’t bust your wallet. It made the top 10 list of healthy foods for under $3. Kale This popular member of the cabbage family is also packed with good-for-you nutrients. One cup of chopped kale has 33 calories and 2 grams of protein. It has close to seven times the daily recommended dose of vitamin K and over twice the daily recommended amount of vitamin A. It’s also an excellent source of vitamin C and potassium, and a good source of calcium, iron, and folate. Kale contains the plant compound lutein, which has been linked to eye health. Vegetarians rely heavily on broccoli because it’s high in calcium. Companions: Cilantro makes it grow REALLY well, bigger, fuller, greener! Lettuce amongst the Brassicas confuses Cabbage Moths which dislike Lettuce. Broccoli can be started in the ground from seed late July, August. If you grew transplants, as soon as they are ready, or transplants are available in the nursery, plant them then for sooner heads. Protect with coverings if the weather is hot. At the same time you plant your transplants you can also start seeds. That gives you a second round of plants in succession to keep a steady fresh table supply. Keep planting every one or two months through January. In January, be mindful of the days to maturity per the variety. Think about how you will be wanting space to start your spring for summer plants. Brocs prefer full sun, though partial shade helps prevent bolting (suddenly making long flower stalks). Brocs LOVE recently manured ground. Well-drained, sandy loam soils rich in organic matter are ideal. Broccoli plants will grow in almost any soil but prefer a pH between 6.0 and 7.0 for optimum growth. A pH within this range will discourage clubroot disease and maximize nutrient availability. Brassicas don’t link up with Mycorrhizae Fungi. It won’t hurt them, it just wastes your time and money to use them. Depending on the variety/ies you choose, seedlings should be 8″-10″ apart with 30″-36″ between the rows. Broccoli yields and the size of broccoli heads are affected by plant spacing. The tighter the spacing the better the yields, but the broccoli heads will be smaller. If you intend to keep your plants for side shoots, plant taller varieties to the northmost so they won’t shade shorter summer plants you will soon be planting. There is no need to mulch during fall and winter growing, but your Brocs and kale that you may keep over summer are the first plants you will mulch as weather warms! Mulch them deep! They thrive when it’s cooler. Mulch helps keep soil cool and moist as well as reduce weed competition. An even moisture supply is needed for broccoli transplants to become established and to produce good heads. Never let the seedbed dry out. In sandy soils this may require two to three waterings per day. Put a ring of nitrogen around cabbage, broccoli and cauliflower plants, to grow bigger heads. The center head produced by broccoli is always the largest. The secondary sprouts produce heads from a 1/2 to 3 inches depending on the variety you choose. Sidedressing can increase yields and size your side shoots. Cool weather is essential once the flower heads start to form. It keeps growth steady. Brocs are truly susceptible to aphids. Yuk. Grayish greenish soft little leggy things that blend right in with the side shoot florettes. If you snap your fingers on the side shoot, you will see the aphids go flying. Those side shoots I remove. If aphids are in curled leaves, I hold the leaf open and hose them away with a strong burst of water! Then I keep my eagle eyes on them, each day, checking to get rid of them before another colony forms. Often whiteflies follow aphids. Aphids and whiteflies mean ants. ARGENTINE ants prefer sweet baits year-round. Protein baits are attractive to Argentine ants primarily in the spring. See more Veggie Pests – Aphids and Ants! Are you finding little, or grr…, big smooth-edged roundish holes in some of your Broccoli and other Brassica leaves? Good chance we’re talking Cabbage Loopers, the fat smooth green caterpillar from those unobtrusive little gray bark-like looking moths, Trichoplusia ni. They can snack a small transplant overnight. If your plant is good size you can out wait them. Mind you, if you have only one or two, and your wild birds are doing their job, this snacking may last only 3 to 4 weeks. Lift up those leaves and find the culprit(s). Toss it/them somewhere where the birds will have a gourmet meal. If there are way too many, then it’s time to go to the nursery for some kind of defender/killer stuff like B.t., Bacillus thuringiensis. If you eat unsprayed or untreated leaves, the holes are more cosmetic than harmful, no problem. Plant lots of Lettuces between/among your plants! See more at UCSB IPM. Those pretty little white Cabbage Butterflies? Pieris rapae, Pieris brassicae. They make quite different caterpillars – bristled and spotted, more skinny with lengthwise yellow stripes, only 3/4″ long. We don’t want them either. They feed on the underside of leaves during their first week, and feed from the topside during their second week. You can see they are harder to catch the first week… Often when they are around, it’s seriously called an infestation. Ruination. Remove yellowing leaves asap because whiteflies are attracted to yellow. Also, dying parts of the Brassica family of plants produce a poison that prevents the seeds of some plants from growing. Plants with small seeds, such as lettuce, are especially affected by the Brassica poison. A professor at the University of Connecticut says Brassica plants should be removed from the soil after they have produced their crop. Brassicas are susceptible to mildew. Plant them far enough apart per the variety/ies you are planting so there is good air flow. Water no more than they need. Too much water or too much manure make mildew habitat and soft leaves aphids and whiteflies like. Water in mornings at ground level so leaves have time to dry if they get wet. Chives, Coriander/Cilantro, Garlic, Geraniums, Lavender, Mint family (caution – invasive), and onions are said to repel aphids. Lettuce repels Cabbage Moths. Plant lots between/among your plants. Mustard and nasturtium can be planted near more valuable plants as traps for aphids. A word to the wise, nasturtiums are snail habitat. Important planting tip: Research shows there are less aphids when you plant different varieties of brocs together! I’ll bet that works for other plants too! Broccoli varieties vary considerably, tall, short, more heat tolerant or cold tolerant, some make tons of side shoots, small heads, large heads! For smaller heads, grow quick maturing varieties. Packman is the exception! It can produce 9″ heads! Calabrese 58 – 80 days; Italian, large heads, many side shoots. Loves cool weather. Does best when transplanted outside mid-spring or late summer. Considered a spring variety. Disease resistant. DeCicco 48 to 65 days; Italian heirloom, bountiful side shoots. Produces a good fall crop, considered a spring variety. Early, so smaller main heads. Green Comet 55 days; early; hybrid, 6” diameter head, very tolerant of diseases and weather stress. Heat tolerant. Green Goliath 60 days; heavy producer, tolerant of extremes. Prefers cool weather, considered a spring variety. Nutribud, per Island Seed & Feed, is the most nutritious per studies, having significant amounts of glutamine, one of the energy sources for our brains! Purple broccoli, in addition to this, contains anthocyanins which give it its colour. These have antioxidant effects, which are thought to lower the risk of some cancers and maintain a healthy urinary tract as well. Packman 53 days; early hybrid, 9” head! Excellent side-shoot production. Waltham 29 85 days; late, cold resistant, prefers fall weather but has tolerance for late summer heat. When it gets late in their season, cut lower foliage off on their sunny side so small summer plants can be started under them while you are still harvesting your winter plants! The days to maturity on seed packs starts with when you put the seed in the soil. The days to maturity on transplants is from the time of transplant. Broccoli is notorious for uneven maturity, so you will often see a range of days to maturity, like DeCicco above. So don’t expect clockwork. Harvest the main head while the buds are tight! Cut about 5” down the stem so fat side branches and larger side shoots will form. Cut at an angle so water will run off, not settle in the center and rot the central stalk. The respiration rate of freshly harvested broccoli is very high, so get it in the fridge asap or it goes limp! It should not be stored with fruits, such as apples or pears, which produce substantial quantities of ethylene, because this gas accelerates yellowing of the buds. Edible Flowers! If you didn’t harvest your side shoots and your broccoli has gone to flower, harvest the flowers and sprinkle them over your salad, toss them in your stir fry for a little peppery flavor! You can get more side shoots, but things will slow down and there comes a time when you pull the plant. SeedSaving! Broccoli must be kept separated from other cole crops by a mile to prevent cross-pollination. That is impossible in a community garden. Better there to buy new seed each year. Another factor to consider is Broccoli are mostly self-infertile. For seedsaving purposes they need to be planted in groups of at least 10 or more. For most of us that isn’t going to happen. Then, you need two years to do it! Broccoli, like all the Brassicas – cabbages, cauliflower, kale, Brussels sprouts – are biennials. So unless you have some extreme weather shifts, and they flower early, you wait overwinter until next spring. If you have an early opportunity to save seeds, lucky you! They are viable 5 years. If you are in a snow zone, dig up the seed plants at the end of the first growing season if the winter temps in your area fall below 32 degrees Fahrenheit. Replant in pots of sand. Store the sand pots over the winter between 32 and 40 degrees F. Transplant the seed broccoli back to the garden the following spring. Allow the plant to go to seed, or bolt, during the second season. The seeds are easy to harvest, but get them before the birds do! Poke some holes in a plastic bag. Pop the bag over the drying seed pods and wait until they are entirely dry. Collect the dry seed pods, and still let them dry a week or more off the plant. No moisture, no rotting. In a baggie, rub them between your hands to pop them open to release the seeds. The trick to producing excellent broccoli heads is to keep the broccoli plants growing at a strong steady pace. Top-dress the plants with compost or manure tea; or side-dress with blood-meal or fish emulsion; and water deeply. Repeat this process every 3-4 weeks until just before harvest! John Evans, of Palmer, Alaska, holds the world’s record for his 1993 35 lb (no typo) broc! He uses organic methods! And, yes, moose eat broccoli! Some of your choices will be the same as what your family always did. Or, you may be a permaculture type doing a Food Forest guild system. There is no right way. You are you, your situation unique. You may be the same the rest of your life, only influenced by drought, deluge, seasons or climate change. You may be research oriented and enjoy trying out new plants and practices from across the world, allowing volunteers the birds bring to grow. You might decide to leave an untouched wild area in the name of freedom or magic, or rest a section of your garden each winter! Or plant it to green manure! Make your garden a shape that flows with the area, whether that be simply the space available, or contoured to the land. Use slopes and hillsides! (Image by Arterra LLP Landscape Architects) Grow permeable windbreak shrubs to slow wind. If you don’t have outdoor space, but do have a sunny doorstep or balcony, put those containers to work! See some smart design ideas and tips at the Magic of Permaculture! Where is the summer and winter sun path in the sky? Design to plant so tall plants don’t shade out the shorties – generally that is tall in the North, short in the South. If you have only morning sun, you plant tall in the West, vice versa for only afternoon sun. A full 6 to 8 hours of sun is best for almost all veggies. You can do shade, but it’s slower and fruits are not as big or plentiful. What plants do you want? Will you judge by nutritional value first, return per square foot? Will you really eat them or has your family just always grown it? Will you be biodiversely companion planting or monoculture row planting? Where will biggies like that Winter Hubbard Squash, pumpkin, squash or melon, artichoke fit or is there really enough space for it per its production footprint? Do you need it to cover space while you take a break from other planting? Are you growing for food or seed or both? Waiting for plants to flower to seed takes time, and the space it takes is unavailable for a while. But bees, beneficial predator insects, butterflies and birds come. And you will have seeds adapted to your area for next year’s planting, plus extras to share, perhaps take to the Seed Swap! Would be lovely to put in a comfy chair to watch the garden grow, see birds, listen to the breeze in the leaves, read a bit and snooze. Or a social area, table, chairs, umbrella. Have candlelight summer salads in the garden with friends. This is at Davie Village Community Garden in Vancouver’s West End. Plant sizes, time to maturity There are early, dwarfs, container plants that produce when they are smaller, have smaller fruits. There are long growing biggies that demand their space, over grow and outgrow their neighbors! Maybe you don’t need huge, but just enough for just you since it’s only you in your household. Or it’s not a favorite, but you do like a taste! The time it takes to mature for harvest depends on weather, your soil, whether you feed it or not along the way. The size depends on you and the weather also, but mainly on the variety you choose. You can plant smaller varieties at the same time you plant longer maturing larger fruiting varieties for a steady table supply. How long it takes to maturity, and the footprint size of your mature plant is critical to designing your garden, making it all fit. The other is to plant in ‘layers!’ Plant an understory of ‘littles’ and fillers below larger taller plants ie Lettuce under Broccoli. They do double duty as living mulch! Now that we know how much space you have and your purpose for growing each plant, we can estimate how many plants of each you need, how many seeds you will need if you plant from seeds. Know that Mama Nature has her own schedule – lots of rain, no rain. Wind. Hail. Heat. Birds love picking seeds you planted and snails/slugs are perpetually hungry. We won’t speak about gophers. Add to your number of seeds to account for surprises and gardener error. Get enough for succession plantings. If you are a SoCal gardener, you may plant several times over a season. Plant bush bean varieties and determinate tomatoes for soonest table supply and to harvest all at once for canning. If you want a steady table supply all season long, also plant pole bean varieties and indeterminate tomatoes. If you have a Northern short season summer window, you may choose cold tolerant early bush and determinate varieties for quicker intense production. Graph paper, sketches, a few notes jotted on the back of an envelope, in your head. It all works and is great fun! If you sketch it, keep that sketch to make notes on for next summer’s planning! September Starts SoCal’s Second Season! Last Harvests are being collected and stored! Some of you have started seedling nurseries or starts at home, many have prepped their soil and harvested seeds! If you didn’t yet, make your fall planting beds extra yummy – add 5-10% compost, 25% worm castings, manures – the amount depending on the type of manure. We want rich soil for those big winter plants. Seeds do especially better with worm castings! We want lots of those marvelous leaves for greens. Winter plants like brocs, collards, cauliflower, chard, are heavy producers, need plenty of food. Some of you carry your layout plan in your head, others draw and redraw, moving things around until it settles and feels right. Do add a couple new things just for fun! Try another direction. Add some herbs or different edible flowers. Stand back, take a deep breath and ask yourself why you plant the way you do. Anything been tickling the back of your mind you are curious about? You can cover it deeply with all the mulch materials you can lay your hands on up to 18′ deep. Believe me, it will settle quickly. Let the herds of soil organisms do their work over winter. That’s called sheet composting or composting in place – no turning or having to move it when it’s finished. If you are vermicomposting, have worms, add a few handfuls to speed up and enrich the process. Next spring you will have rich nutritious living layers of whole soil soil for no work at all! You can plant it with green manure. Laying on lots of mulch is a ton of work when you do it, just gathering the materials can be a challenge. Green manure takes some work too, but it has awesome results as well. You broadcast a seed mix of legumes and oats and let them grow. Bell beans, Austrian peas, vetch and oats from Island Seed & Feed Goleta is an excellent choice. Legumes gather Nitrogen from the air and store it in nodules on their roots! N is the main ingredient your plants need for their growth! The oat roots break up the soil. They dig deep and open channels for water and air. If you decide to plant, unless you have Bagrada Bugs, it’s Brassica time! They are the mainstay of winter gardens! Their leaves are edible – Kales the Queens! Broccoli, Brussels sprouts, cabbages, Cauliflower and collard greens! Then there are all the mini Bs, the fillers and littles – arugula, bok choy, mizuna, kohlrabi, mustards, radish, turnips. Rather than plant six pack transplants, put in seed when possible and stagger your plantings of the large Brassicas. Rather than all six cauliflower coming in at once, plant two now, two later and so on. Adjust that, of course, if you have a large area available to plant and a lot of people to feed! Another way to do it is to get varieties with early, middle and late maturity dates and plant them all at once! Plant both mini and monster cabbages at the same time! Minis come in sooner, monsters later! Finicky eaters may enjoy a marvelous selection! Fall veggies come in lots of shapes and colors! Kales are renowned for their beauty and varieties – classic curly leaf, Red Russian, Elephant, Red Bor, that is really purple, are just a few! Cauliflower comes in traditional shape and spiral, classic white and yellow and purple and green! Get seed packs of them all and mix them together! Carrots already come in color mix seed packets! Circus Circus is a fun choice, especially when your kids are planting! Beets are terrific fun! Yellows, reds, pinks, whites and Chioggias (circles of colors)! You can get them in rainbow mixes just like getting rainbow chard mixes! Rather than have your finicky eater say no, open up that catalog or take them shopping a the nursery and let them pick what they would like to try! The winter legume is PEAS! Peas are like beans, they come in bush and pole types. And those come in three main types – shelling, eating snap peas and flat China/snow peas! They are super easy to sprout! Dampen the paper towel; spray the towel to keep it moist. Takes 2 to 4 days. Pop them into the garden by the trellis – if it is hot, devise some shade for them. You just need to be careful as you plant them so you don’t break the sprout off. Definitely plant some every month or so. They don’t live all season long. When they are done, they’re done. It is true that picking peas, just like picking beans, is labor intensive. I eat a lot of mine before they get home, so I don’t mind. Bush peas come in first and pretty much all at once; pole come on later and continue to produce. On the first round it makes sense to plant both at once! Combos make a difference! Carrots enhance peas, onions stunt peas. Plant the carrots on the sunny side feet of pole beans. Combos can use space wisely! Carrots grow down, peas grow up, perfect! Cabbage babies need to be planted 12 to 28″ apart! A healthy plant will take up much closer to that 28″. They take a long while to grow, head, head tight! Plant lettuces that repel cabbage moths, or other fillers, that mature sooner, in the space between them. You can do this at home amongst your ornamentals, and/or in containers too! Fillers can be onion/chive types, beets. Short quickest growing winter radishes can be among the long slower growing carrots among the slowest growing, your cabbages. Cilantro makes brocs grow REALLY well, bigger, fuller, greener! Research has shown there are less aphids when you plant different varieties of brocs together! No need to plant patches or rows, unless you want to. Scatter them about on the sunny side between larger plants as an understory! Plant different varieties to keep your table exciting. Don’t plant them all at once, but rather every week or two for steady table supply. If you would enjoy a quick payback on your table, select the earliest maturing varieties. If you have lots of seeds, overplanting is an age old practice. Plant too, too many, then thin them with tiny pointy scissors, aka harvest the young, and eat ’em! Young radish sprouts, teeny carrots, little Brassicas of all kinds are wonderful in a salad! If they get a little big, steam them or add to stir fries and stews. Another way to do it is plant flats of lettuces, mesclun mixes, and mow them! Tender baby greens! They will grow back 3, 4 times. Keep letting your strawberry runners grow for Oct harvest. Plant in October or plant new bareroot plants. If you replace your strawberries, in Santa Barbara try Seascape, bred at UCSB. Big plentiful berries, firm, tasty, strawberry spot resistant! 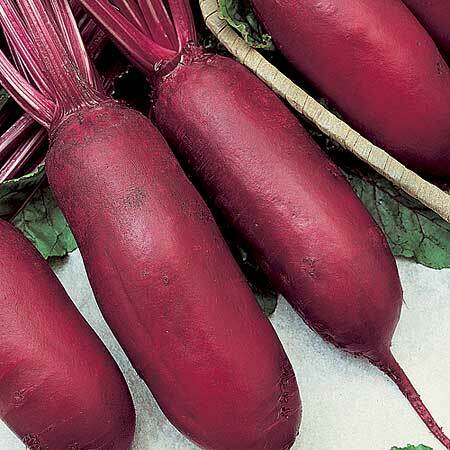 They have long roots that gather plenty of nutrition and stay moist at deeper levels. Remember, strawberries like slightly acidic soil, so get Azalea/Camellia compost for their bed. Brassica pests! Lots of ants and lengthwise curling leaves are the giveaways for aphids. Aphids carry viruses. Aphids come in fat gray or small black. Avoid over watering that makes for soft plants, tender leaves that aphids thrive on, and ant habitat. Spray the aphids away, make the ants leave. Get up under those leaves, and fervently but carefully do the tender growth tips. Do it consistently until they don’t come back. September is still Seed Saving time for some. Make notes on how your plants did, which varieties were the most successful. These seeds are adapted to you and your locality. Each year keep your best! Store your keepers in a cool dry place for next year’s plantings. Generously gather seeds for upcoming January Seed Swap! Borage is a magical cool season plant with edible flowers, blue for bees! It has a large 3 to 4′ footprint, so allow for that or plan to keep clipping it back. Plant Sweet Peas for Christmas bloom! Plant gift plants or bowls or baskets for the holidays! Fall bounty is on its way! The Green Bean Connection started as correspondence for the Santa Barbara CA USA, Pilgrim Terrace Community Garden. All three of Santa Barbara city community gardens are very coastal, during late spring/summer in a fog belt/marine layer area most years, locally referred to as the May grays, June glooms and August fogusts. Keep that in mind compared to the microclimate niche where your veggie garden is. Bless you for being such a wonderful Earth Steward! See the entire September 2016 GBC Newsletter! Designing Your SoCal Winter Veggie Garden! Think Big! Two Mexican Herbs Used Instead of Cilantro! Events! National Heirloom Exposition in Santa Rosa CA, 6th Annual Fermentation Festival, Master Gardeners’ Year-Round Edibles from the Garden – Fall Planting! 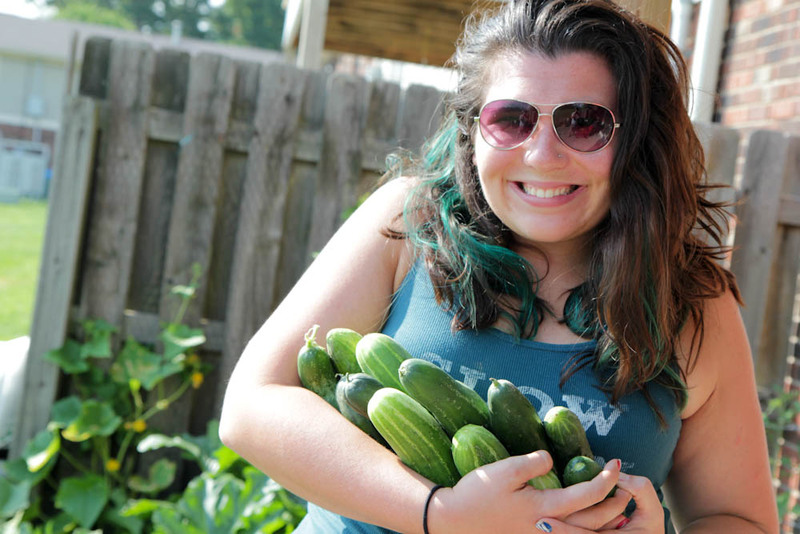 …and wonderful August images at Rancheria Community Garden!